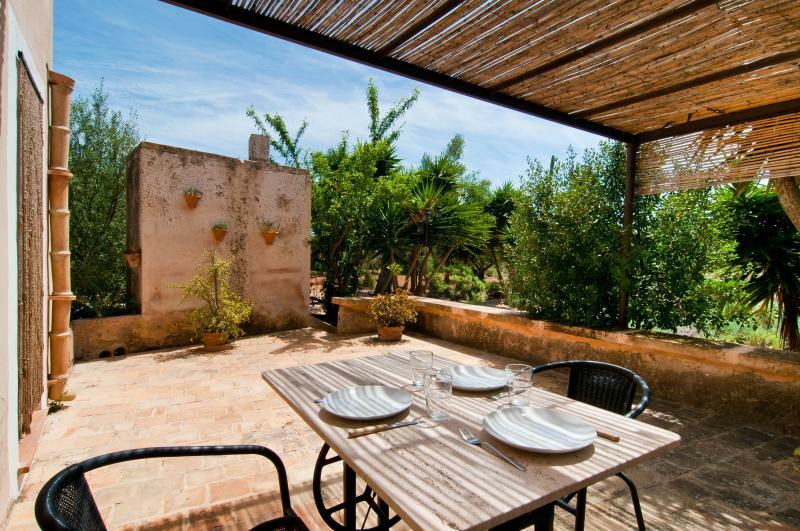 Welcome to this typical Majorcan house with capacity for 6 to 8 people. 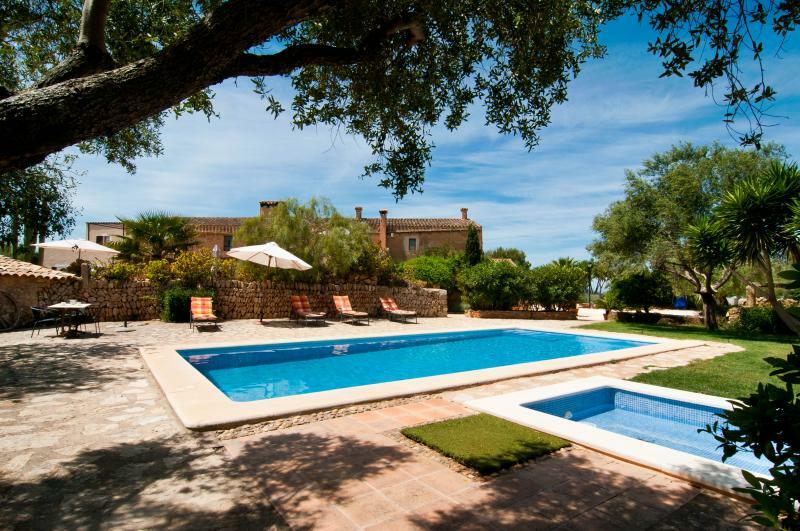 It is situated 10km from the town of Manacor, in an agricultural setting of the "Serra de Llevant". In the exteriors of this property, you can relax in the garden, admiring the beautiful view, sunbathing on one of 6 loungers, read a book under the umbrella or cool off in the chlorine pool of 6 x 3m and a depth ranging from 0.60m to 1.40m. The house features also a large porch, terrace with mountain views, barbecue and orchard. The interior of the house has 140m2 distributed on one floor, and consist of living room, kitchen, 3 bedrooms, laundry and 3 bathrooms. In the same spacious area you will find the fully furnished living room, dining area furnished with table and chairs and the equipped kitchen with all appliances and utensils needed to cook comfortably. There is a separate laundry with washing machine, vacuum cleaner, iron and ironing board.There are 3 bedrooms equipped with air conditioning. One of them has a double bed and en suite bathroom with shower; and the other two have two single beds each. There are 2 more bathrooms with shower. For younger guests we can offer a cot and a highchair. A double sofa-bed can be prepared upon request. This nice house is situated only 10 kilometers from the town of Manacor, known for its pearl factory and numerous quality furniture stores. In the center you can go shopping and also try typical Mallorcan meal in one of the excellent restaurants. If you like hiking, you can do so in the called "Via verda", where used to pass the railway to the town of Arta. Today, it is a very charming way for cyclists and hikers. The eastern coast of Mallorca, cca 20 min driving, is full of wonderful beaches. In Porto Cristo you will find a nice sandy beach, but also a harbor, restaurants and the famous Caves of Drach. These caves will surprise you, by their stalagmites, stalactites and underground long called Llac Mantel. Cala Millor is ideal for having a drink at night or visit the zoo safari, where especially children will enjoy. Cala Magrana, Cala Mendia, Cala Romantica, S'Illot and Cales de Mallorca are just a few examples of beautiful eastern beaches of fine sand. There is an outdoor parking for 3 cars.